Today is the day many of you have been waiting for – the grand opening of the CARE Safari Suites! The construction of the suites has been the largest project CARE has ever attempted. Like many great plans, it started as a small idea, then grew into a giant project! A 9,000 sq. ft. exterior enclosure for Zuberi and Araali. This space is full of trees and green grass. Plenty of room to walk, play, and roar! Zuberi and Araali’s 500 sq. ft. interior, climate-controlled medical care center features a 50” HD TV with plenty of stimulating cartoons to watch. Their favorite shows are Dora the Explorer, Bubble Guppies, and wildlife documentaries on Animal Planet! Finishing this interior enclosure was a priority due to their early struggles with life threatening illness called Wobbler's Syndrome that requires them to have protective, comfortable living space. Although their condition has greatly improved, constant monitoring is essential to their well-being. A volunteer rest area was added to allow the dedicated and often exhausted CARE workers relief from the Texas elements. Three twin beds are available to be used by senior volunteers who may need to stay overnight for special events or for long-term medical observation of the animals. If asked nicely, Zuberi and Araali may even share their TV with the volunteers! A gigantic enclosure was built for our young tigers, Slade and Boomer. Over 10,000 sq. ft. of Texas countryside was developed for their special living area. The view is stunning. They will be moving in next week after the install of their pools and platforms is complete. Nestled 16 feet above the lion and tiger enclosures, the newly built Safari Suites are the non-animal crown jewel of CARE. 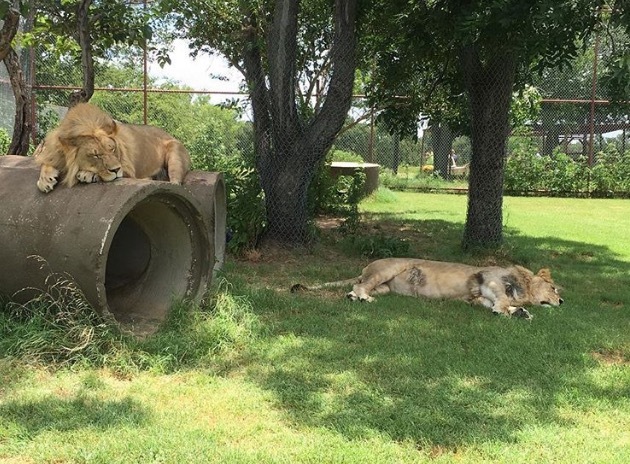 Imagine dining in your luxurious accommodations above CARE’s beautiful lions lazing in the Texas sunset, or sipping wine on your terrace as you watch the tigers, Slade and Boomer, frolic below. Over the east terrace, you will also see the energetic lemurs in their enclosure; leaping through the air with ease. That is not all – suite guests will also receive a behind the scenes tour of the CARE facility including meeting all of the lions, tigers, bobcats, llamas and more. Guests will have the opportunity to safely feed the king of the feline beasts and the sweetest of little primates. This has been a labor of love by many. This endeavor could have never been completed if CARE did not receive high-quality interior furniture and decor donated by home furnishing company, ATG, metal piping used to build the big cat enclosures donated by Woodstock Tube, and all of the considerable financial donations given by so many. You can also reserve your stay in this one-of-a-kind retreat at any time, please visit wildanimalretreat.lodgify.com for more information and booking. The special introductory donation to CARE for a stay in the suites with all of the amenities is $750 per night. Guest donations will help CARE continue giving a safe and loving home to some of the planet’s most amazing creatures. You can also see more pictures of the suites on our Facebook page! All 1,280+ donors who helped us raise the funding needed for the project - literally could not have accomplished this without each and every one of you! ATG who donated the interior furnishings and decor for the suites! Triple B Builders - For planning, development, and construction! U.S. Mattress who donated all of the AMAZING mattresses used in the suites! Wave Custom Pools for our amazing pool service! Curtis Hutson and Policeman Movers for getting all of the furniture from Dallas to CARE! Jeff and Cindy Parker of Parker Custom Ironworks for welding done on the enclosures, suites, and signs! Decatur Heat and Air- For installing all of the AC units! Rich and Denice of Bugs and Ashes for installing the patio flooring and handling our pest control! Sherwin-Williams for supplying the paint! IESI/Progressive Waste Solutions for all of our waste disposal! Woodstock Tube LLC (Alabama) for donating metal for the enclosures! Rock City Burgers for feeding the work crews! And, last but certainly not least, all of the CARE Interns and Volunteers who worked tirelessly on this from planning, to fundraising, to building. Particularly, thank you to Heidi Krahn who dreamed this dream, saw it through, and never gave up or gave in!